By the end of WWII, the Soviet Union was the undisputed leader in the field of tank warfare. Starting the Great Patriotic War against Germany with the superb T-34, continuous improvement of this vehicle, alongside successful development of a range of heavy tanks and self-propelled guns, gave the Red Army a formidable range of armoured assault vehicles. Their Herculean manufacturing capacity meant that production of this armoured arsenal far outstripped that of Germany, allowing the Soviets to amass several thousand tanks for the push on Berlin in 1945. Just as the final battles of the European war were being fought out, an outstanding new design appeared: the IS-3 “Iosef Stalin” heavy tank. Developed from the generally successful IS-2 series, this vehicle combined an enormously powerful 122 mm gun with innovative armour design, including the angled glacis plate and flattened hemisphere turret (OK, everyone calls it an “inverted frying pan”). Almost certainly too late to see active service in Germany, it is believed that the IS-3 did participate in the Soviet invasion of Manchuria in August 1945, and certainly it came as a major shock to the Western Allies when they first saw it in September of that year. While both innovative and influential, the design had a number of flaws (including poor quality control on the glacis plate and cramped conditions inside the turret) which meant it was not produced in massive quantities. However, it was widely considered the best overall tank in the world in the late 1940s – and a mean-looking brute at that! 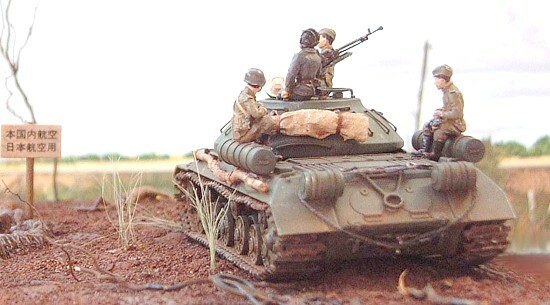 Given its importance in tank design, it is surprising that in small scale only Airfix had produced an injection-moulded IS-3 (in 1:76 scale) prior to the release of Roden’s 1:72 offering in 2001. As a modeller primarily of aircraft, I am familiar with the high quality of Roden’s aeronautical offerings and given my growing interest in Braille-scale armour, I thought this kit would be a winner. And it is. Although packaged in a typical flimsy end-opening box (featuring colour scheme details on the back), the kit inside survived postage OK and comprises 122 injection-moulded parts on two sprues, plus a vinyl sprue containing some very nicely moulded rubber-band tracks and a few segments of links. Regarding the latter, the quality of moulding on the outside and inside of the tracks is very high; in fact, I used the small sections to attach to the hull. I would have had no problem using the kit tracks on this model except that all IS-series tanks showed a pronounced sag as the tracks passed over the return wheels and this is difficult to imitate with rubber-band style mouldings. I therefore replaced the kit tracks with an injection-moulded set of KV/IS-series link-and-length units from PST. Returning to the kit, the green plastic is of a good consistency, with sensible engineering and no highly-visible ejector pin marks or blemishes. The hull and turret are moulded with a slightly roughened finish to replicate cast components, and this is not too badly done. Some very fine detail is reproduced, including the DSK machine gun which is probably the most exquisite moulding of such I have seen in Braille scale. The instructions consist of 8 pages in A5, including very clear assembly diagrams and painting charts showing Egyptian, Polish and Chinese machines. There is also a nice (if small) decal sheet, although as I didn’t use it I can’t comment on the quality of the decals. As with many small-scale armour kits, the devilish part is in preparing all of the small parts, and with over 100 tiny components this did become a bit of a chore. The wheels in particular – comprising 46 parts in total – all needed to have mould ridges sanded off the circumference (a task made a little easier by assembling each 2-wheel unit before sanding). Otherwise the wheels and suspension went together pretty well, and the kit even includes the two small mud scrapers to stop fouling of the rear drive sprocket! The hull sections assembled reasonably well but the bottom and top did not quite match up, requiring a bit of filling and sanding under the glacis plate. There were also some gaps where the side plates met the underside of the hull, which meant that it was better to assemble the entire hull first before attaching suspension arms (I kept the wheels separate for painting). The turret went together well, with the join line through the actual casting seam, although there was a slight mis-moulding on the muzzle brake which required a sliver of plastic card to correct. You can even turn the turret and elevate the gun! I painstakingly prepared and attached the kit-supplied grab rails to the turret, but these are rather flat in cross-section so it would have been much simpler and more accurate to simply drill out the attachment holes and create new rails with fine wire. As noted earlier, the turret-mounted machine gun is a work of art but very delicate. I only added a few embellishments. While the kit’s auxiliary fuel tanks are fine, I added two securing straps from thin plastic strip for each one. Based on photos, I also used plastic tube and rod to create a pair of smoke generators on the rear attachment points. Finally, I opened up the commander’s (left) hatch on the turret and created a replacement by mixing the remainder of the kit part with plastic card. The only other non-kit addition to assembly was the PST link-and-length tracks which were added after painting. While I had no specific reference, I chose to model my IS-3 ‘on campaign’ in Manchuria, 1945. I therefore opted for the simplest scheme – flat green with no markings. After reading around I settled on a colour that was basically Imperial Japanese Army green, but lightened in the centre of panels and on upper surfaces. The whole tank was then darkened by the addition of a burnt umber oil wash to add some depth to the recesses and panel lines, and a black wash for deep areas such as the engine covers. I then sprayed a fine mist of gunmetal over the model, just to add the faintest hint of metal in the paint – I like the effect but I’m sure it’s not to everyone’s taste. The ‘cast’ effect moulded onto the plastic showed through the paint reasonably well. A dark grey pencil was then used to provide scratch and scuff marks on panel edges and high-wear areas, bearing in mind that this was a relatively new machine. The wheels were then added (whoops, I forgot to paint the tyres black, but this wasn’t a major problem after final weathering) and I then assembled sections of the link and length tracks to fit around them (including some prominent ‘sags’), painted the sections in a mix of grey and gunmetal, then weathered and attached them. A few of the vinyl track sections were also added to the hull at this time. I also now attached a tow cable from cotton thread soaked in gunmetal paint, a rolled-up tent (made from tissue paper dipped into tan paint) and an unditching log (twig) – the latter both secured with dental floss soaked in dark brown paint to represent leather straps. A little light rust was applied to the tracks, then the whole model was weathered over with a mix of brown pastels, especially on the running gear. 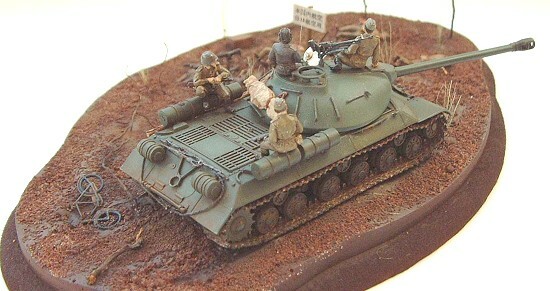 Several figures from the excellent AB Miniatures “Soviet tank riders” set were painted and attached to the model, and it was then set on a small diorama base representing an overrun Japanese forward position to represent “Stalin’s Manchurian debut”. This kit is very well crafted, with only a few small assembly problems. The most time-consuming aspect of construction is cleaning up the myriad small pieces. It can be built into a nicely detailed kit without the addition of aftermarket parts, and there are several interesting options on the decal sheet if which cover several post-war IS-3 users. It aligns closely with the plans and photos in my references, and looks ‘right’ when built. All in all, an enjoyable if not speedy build, and definitely a must for fans of Soviet armour and those with a more general interest in historically significant tanks. Steve Zaloga and Peter Sarson. 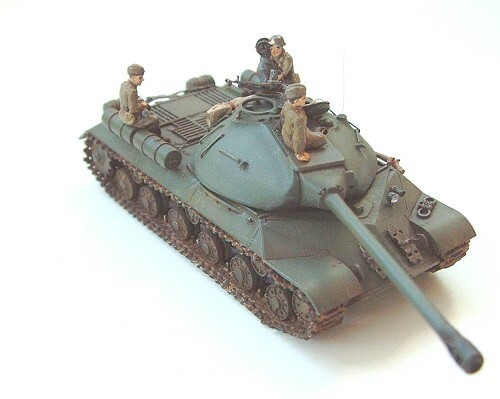 IS-2 Heavy Tank 1944–1973 (New Vanguard No 7). Osprey, 1994. Tim Bean and Will Fowler. Russian Tanks of World War II: Stalin's Armoured Might. Ian Allan, 2002.